The Lao Government will strive to complete 12 hydropower dam projects in 2019 with a total capacity of 1,950MW, reported local media. 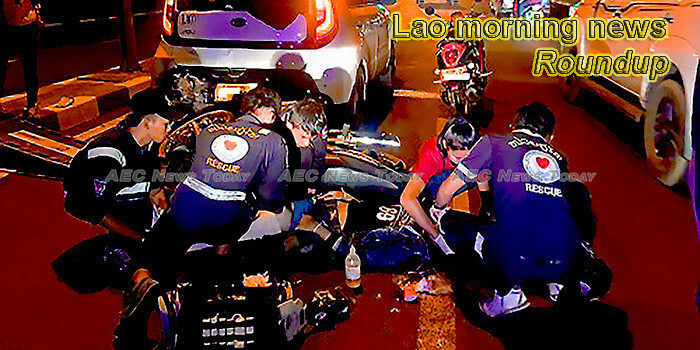 Some 238 people’s lives have been claimed in road accident during the celebration of New Year 2019 in Vientiane. Yet the death toll represents a decrease of 5 per cent as compared to last year. The National Committee Against Money Laundering and Funding for Terrorism held its second Annual General Meeting 2018 on December 27 at the Bank of the Lao PDR Hall, honoring the presidency of Mr. Somdy Duangdee, Deputy Prime Minister, Minister of Finance, President of KT. Mr. Le Van Tieng, Director of the Central Committee of the Ministry of Agriculture and Forestry, and his wife and leaders at the provincial and district levels attended the visit to the People’s Villages at the development site of Namdong Village, Bantong District, Xayaboury Province. Amphetamines and heroin were the most frequently confiscated items during a police crackdown on the drug trade in the capital this year. Seven Lao Christians arrested at the weekend for conducting an “illegal” church service have been released and allowed by police to return to their homes, a Lao source said. Lao people nationwide together with people around world celebrated the New Year with hopes of greater achievements in life during 2019. Association News Lao PDR ceremonies award products and print ID photos on the theme “Tourism’s 2018” held on 31 December last station national television Laos to attend the awards your light rings of the Minister of Information, Culture and Tourism (Laos) Chairman Steering Committee level in Tourism Year’s 2018, your heavenly city north Dortmund drug makers Prime Minister of Laos, president of the Lao Journalists Association, invited guests, parties involved and who received the award participants. Savannakhet province has disciplined more than 30 officials and many others are being investigated over various forms of misconduct and corruption, local media reported. The Youth Movement of the Youth and Youth Congress of Youth organized a summit of the Central Committee for Disaster and Disaster Prevention and Control in 2018 on 28th December, honoring the presidency of Mr. Al Rusai, the Central Committee of the Secretariat of the Executive Committee of the Party, the heads of the departments, departments and relevant officials. Individual members of news outlets on Monday received awards for outstanding coverage in relation to Visit Laos Year 2018.